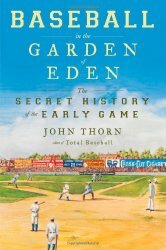 John Thorn had an unconventional start for someone who would become Major League Baseball’s official historian. 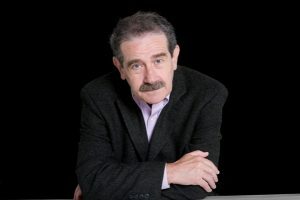 Thorn was born in a displaced person’s camp in Stuttgart, Germany, in 1947; his father Richard, a Holocaust survivor from Poland, worked there as a translator for the Hebrew Immigrant Aid Society (HIAS). In November 1949, the Thorn clan, including John’s mother Victoria and their cousin Adam, came to the United States, settling in the New York City boroughs of the Bronx and then Queens. As a young boy, baseball proved to be a gateway to American society. Ultimately, he would craft a career in the letters: as an editor, publisher, writer and historian. 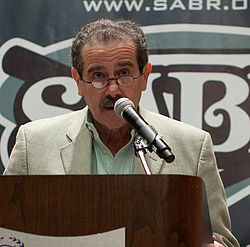 He’s authored numerous books on baseball, football and New York City history; written a column on folklore; and consulted on Ken Burns’s landmark documentary film series on baseball history. 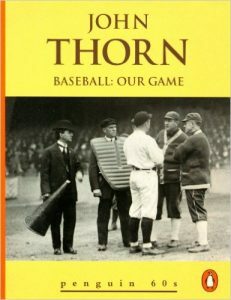 Appropriately, Thorn has been honored by the Society for American Baseball Research. Please shed some light on what you do as official historian of Major League Baseball. Thorn: I talk to people like you, a lot of media stuff. I am the one-stop shop for historical context, especially for writers on deadline. In previous times, I’d imagine, the Hall of Fame and its staff would field queries. They can’t be quite as responsive in the short term as I can, because I have (a) this prodigious memory, and (b) a very good library of resources. There’s also my blog, Our Game. I just posted my 396th entry there, and these entries tend to run 2,000 words, so it’s the equivalent of eight or nine books I’ve posted there. Why do I have the blog? MLB asked me to write more than my predecessor, Jerome Holtzman, was able to do – but he took the job when his health was already troubled. I’m feeling good and still productive, and I take seriously the idea that if baseball fans wish to fully enjoy the present moment or last night’s ballgame, it’s good to know a thing or two about the past. The past provides you with a richer enjoyment. Judaism is a culture and religion with such deep, rich history, details, names and places that all lead to today. Does that mean something in the way we account for sports fandom and the way baseball means what it does to you? Thorn: I think the group phenomenon goes back to: Birds of a feather flock together. You can also say it goes back to [Roman writer] Pliny’s observation that crowds at the chariot races don’t root for particular individuals or the teams of horses, but, rather, for the colors they wear. There’s nothing special about Judaism – Jews identify themselves, to themselves, as People of the Book. Certainly, I’m a bookish person, and, had things gone another way – I went to Orthodox Hebrew-school training and had an Orthodox bar mitzvah – I might have been a Talmudic scholar instead of a baseball historian. The appetite for digging into the past and finding its relevance to the present or even future – it’s pretty much the same impulse, isn’t it? 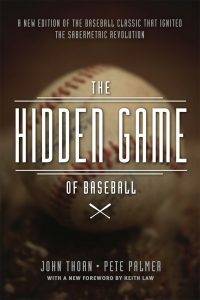 … Sabermetrics has something in common with Talmudic study, in that you can take the slimmest, frailest reed of evidence and torture it, play with it endlessly, see complexity in what, from a distance, is simple. You once told me that you learned how to read because of baseball cards. Thorn: Baseball cards and the backs of cereal boxes – that was my training, yep. What do you remember of the baseball content? Why baseball cards? Thorn: Because I loved the pictures. The kids who hung out at the street corner, down below my apartment house, were flipping cards, and I wanted to be one of the gang. In order to flip cards, I had to have cards. So, I cadged a nickel here and a nickel there, and bought some packs. The cards gave me entrée into the American youth sub-society. It was the activity of flipping, learning how to flip, losing some cards, coming to understand that some pictures were of better players and, thus, were more valuable and you’d hold them back from casual flipping. You learned a little bit about Adam Smith, market economies, supply and demand – and how to become one of the guys. I loved the pictures before I loved the text, but once I had the cards, [it was:] All these mysterious things on the back, all these numbers, what did they mean? I learned what all this stuff meant long before I saw a ballgame. Thorn: 1951, ’52. My first apartment in New York City was in the Bronx. My first night in New York was at the old Grand Central Hotel, where the National League was founded, on Feb. 2, 1876. By the time I got there, it was no longer glamorous and was called the Broadway Central, [which] collapsed in a heap of rubble in its last years when it was an SRO: a single-room occupancy for welfare clients. It was right around the corner from my first job in book publishing. It was downtown, 673 Broadway, as I recall. Did you keep those baseball cards? Thorn: I did keep them for a long time, and I accumulated a great deal more. My mother tossed them out when I went to college – the same old story as everybody else. My standard joke is that my mother is the one who threw out everybody’s baseball cards. What you think baseball can teach kids? Thorn: You can use it to teach science and math, but for me it was a passport to becoming an American. Just living here wasn’t enough, and learning the language wasn’t enough – you had to figure out a way to fit in. The great thing about baseball – especially for a kid of my background, whose parents were Holocaust survivors – was that it seemed fair. Baseball offered justice, it offered balance, it offered seeming simplicity with underlying complexity that I did not appreciate when I was a boy. It did seem utopian – that all you had to do was perform. It didn’t matter where you came from or what your father’s last name was. … Ignored in all this, of course, were African Americans. Were there players whose backgrounds appealed to you in a way, because of how you came to America, how you came into the mainstream? Thorn: No. I did not care about their backgrounds. To me, they existed on the field and in the card. I came to watch baseball on television, and there was an aesthetic appeal to someone like Duke Snider, who had an unusual swing and seemed to have a swagger and a cockiness about him, a confidence. So, I gravitated to players who looked great and performed great. I did not have a favorite utility infielder, and I did not care if somebody came from Arkansas. I would see photographs of some Dodger circling the bases, and there was coach Jake Pitler – and I thought it was cool that here was a Jewish coach on the team for many years. Thorn: What was lovely about that from my point of view was that his Jewishness was not his principal trait, his reason for being there. The idea that you could be part of a club and not be the designated Jew – as Ron Blomberg would have it, The Designated Hebrew, the title of his book – for your Jewishness to be an incidental part of your makeup – that seemed to me the essence of becoming an American. Did you go to games as a kid? Thorn: I did not go to my first game until 1956. My parents did not know a baseball from a kumquat, and thought my preoccupation with comic books and sports was amusing, but never thought, “Oh, maybe I could learn a thing or two from this.” So, at age 9, I had to get my dad to take me. It was his first game, as well as mine. Who played? What do you remember? Thorn: The Dodgers and Giants, at the Polo Grounds. It was the clichéd memory everybody has from their first game: You never knew there was that much grass in the whole, wide world. Coming out of the dark of the tunnels, there was a ramp [opening] to your view of the outfield: bright sun and green grass. The ballgame also was a beauty for me, in that my hero hit a home run: the Duke. Johnny Podres threw a shutout. All was right with the world. Did your dad take you to another baseball game? Thorn: Yeah, he took me to a Yankees-White Sox game, which he discovered, to his chagrin, was a doubleheader. He bravely toughed it out, and we sat through 18 innings. Those were the three ballgames on two dates that he went to. It’s such a part of so many people’s first memories of sports or doing something with their parents: going to their first baseball game together. Do you have a fondness for your dad in taking you to a game because it meant a lot to you? Thorn: I thought it was very gentlemanly of him to sit there and suffer through something he did not understand, did not care about. He made the gesture. Most kids, growing up, will play catch with their dads in the backyard. I never did much with my dad. As patriotic as he was, as my mother was – they were both very passionate Americans – they never cared about sports. Growing up, did you have other relatives who were drawn to baseball? Thorn: Not a one. I will say this, not to my credit, that that may have been one of [baseball’s] appeals, because family was oppressive, family was manipulative and would have you do things to please family. I was really interested in creating a life for myself and separating. Baseball was mine. I could not have my father telling me that I really should be rooting for the Giants instead of the Dodgers, because he didn’t care. For every other thing in life, my parents would tell me what to do. They would criticize my personal choices, but baseball was my personal trout pond. I could fish there undisturbed. Being left alone was one of the principal joys of my childhood. It did not occur quite enough. I absolutely burrowed into baseball, comics and rock-and-roll – things that they didn’t care about. If they didn’t care about it, that was a recommendation, because then they couldn’t express their preferences and then indicate to me that I was doing not quite the right thing. So we’re getting very Dr. Freud here. Baseball is for many a family pleasure. I understand that that’s part of the appeal. But for me, it was a solitary pleasure. The recent World Series included our hometown team, the N.Y. Mets. You attended, I assume? Thorn: I was in the stands for Games 1 and 2 because my son Isaac flew out to Kansas City from Cincinnati to join me. Then, with the next three in New York and two sons on the East Coast, I gave them my tickets and watched from the press box. What was it like watching the game next to Isaac? Thorn: It was more thrilling for him than for me. He’d never seen the Mets in the World Series.